There are times when me, an old Metallian, tries to think what could be of Metal without the most important musical movement for the style: the so-called New Wave of British Heavy Metal, or NWOBHM. Bo be honest, nothing could be done without names as IRON MAIDEN, DEF LEPPARD, SAXON, and even the underground bands like DIAMOND HEAD, TYGERS OF PAN TANG, SATAN, BLITZKRIEG and many others. And even far from those times as we are now, the NWOBHM still inspires a lot of bands. Some are just cloning them (those disgusting Dolly Metal clones), but there are some very good names that are breathing new life onto it. 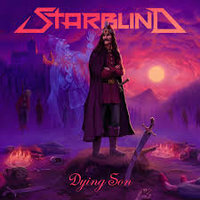 And one good name in the middle of these few ones is the fine quintet from Stockholm (Sweden) STARBLIND, that arrives with"Dying Son", their second Full-length. If you're looking for something really new, I must say that you'll never find it here. But if you're in a search for something with tons of melodic energy, made with very good guitars (where the influence of JUDAS PRIEST and IRON MAIDEN is clear), great work on bass and drums, along with fine vocals (besides some high pitches are really unnecessary), you have found your band. Yes, their work is done for you! The sound quality is a bit moldy in some moments, but it's heavy and clear in the way they need to be. But again I must say: you don't need to sound as the bands did on the 80s or in any moment of the past. Just play it, doing your music with heart, and any sound technique you can use will fit. Songs as the powerful "A Dying Son" (with excellent guitars, both on riffs and solos), the pure Maid-enian song "The Man Of The Crowd" (seems a lot of with IRON MAIDEN from their albums with Paul Di'Anno, with a certain level of technical complexity, but is very hooking), and the long and well worked "The Land of Seven Rivers Beyond the Sea". Not as original as some can demand, but a very good and honest album.